Designer Andrea showing Sara her latest designs. Here with Leaf Necklace in Silver. 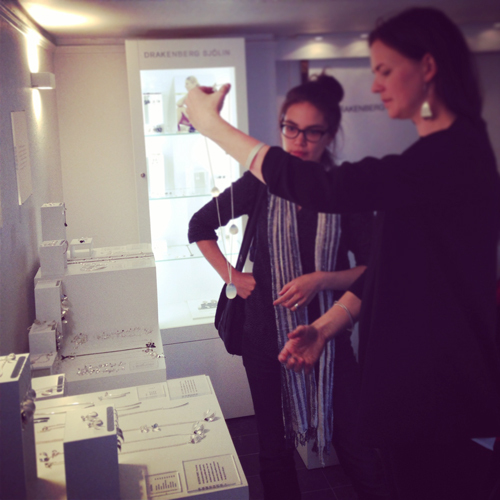 On our latest trip to Stockholm we picked up some new silver jewellery from Drakenberg Sjölin. Inspired by nature, Andrea’s designs are bold enough to spruce up any outfit – whether for work or play. Scandinavian design is loved by minimalists, for the clean lines and simple shapes, but we have selected items that nicely bridge between simplicity and boldness – making each piece a statement. We are sure these will be ‘Bling’ enough for almost any occasion. simply me or maybe webpage on the other hand google and yahoo loaded for me. Anyways, I need to thank you so much for including beautiful post. stuff from you. To obtain additional knowledge from posts you publish, I have bookmarked this web page.